The truth is, I wasn’t smart enough to think of joining TKE. It was my roommate’s idea. So, in 1973, as sophomores, we and 28 other pledges signed up, made it through pledging and became the newest fraters in the bond. Soon after that, we left Carle Hall on campus and moved into the sprawling, slightly derelict TKE house on 53 Marlboro Street. Being off-campus and nabbing the largest room in the house with free reign to do whatever we wanted with it was an awesome feeling. With the other new brothers we came up with a plan to update the house. We completely paneled the basement’s stone walls where we held our Thursday happy hours – the biggest social event on campus every week. It seemed like there were brothers who could fix anything. TKEs repaired the jukebox, house lighting, the pay phone in the front hall and even put in a half bath upstairs. With all the brothers working as a team we were on top of the world. It was in those heady first few weeks living at TKE that I learned of “Ma Stewart,” TKE’s house mother. “Ma” – as all the brothers knew her – lived in an apartment on the bottom floor at the back of the house. It had its own entry so while there was a door from her apartment leading directly into our kitchen, she never needed to use it. And, I don’t ever recall Ma being in TKE house proper during the four years I lived there. She didn’t come see you, anyway. If you wanted to see “Ma,” you simply opened her door and walked into her apartment. While her space was probably no more than 1,000 square feet, it had a large comfortable living room and kitchen with plenty of light. There was a couch, chairs and television in the living room and a simple Formica table with four matching chairs in the middle of the kitchen. 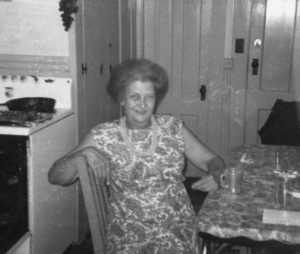 The older brothers told us that “Ma” as TKE’s house mother had only a couple of simple “rules.” First, she always kept beer in the fridge in her kitchen that any brother could have for free. And second, if we went in to take Ma’s beer, we had better sit down at the kitchen table with her and catch her up on the latest TKE news. It was a genius strategy. Brothers were always running out of beer money and everyone knew about Ma’s supply, usually Bud or Schlitz. So, she was sure to have regular visitors and keep up on the happenings to help support we brothers and TKE. That’s pretty much how I got to know Ma. While I drank my share, it wasn’t the free beer that mattered so much. It was more Ma’s sincerity and warmth. She was a great listener with bright eyes, an easy laugh and a quick wit. I never learned how long Ma lived at the TKE house or how she had become the house mother. But it must have been many years because she was full of stories of brothers that had come before. You’d tell her about how you were failing an essential class because the professor had it in for you and she’d tell you how another brother turned that situation around. Or, when something horrible happened, like a death in the family and you felt like you couldn’t go on, she was there for you and seemed to always know the right thing to say to get you back on your feet. While at TKE I always knew Ma had our backs like that. And she was devoted to TKE, too, as much a brother as the rest of us. While I served as Prytanis in my last year at TKE there was a lot of negativity toward the fraternities at KSC. Just before Greek Week arrived in the fall, the school paper the Equinox published a long poem putting down fraternities on campus. It was nasty in tone but cleverly written and it had an immediate impact. We brothers knew we had to counter their points. We just weren’t sure how to do it until we brought the matter before Ma. She said we should copy the Equinox’s poem format but change it around. Instead of being negative, our poem should cover all the good fraternities do on campus and in the community. But most important, our poem had to be entertaining and funny. I remember we spent hours in Ma’s kitchen with her helping us get that poem just right. And when our rebuttal ran in the Equinox, it was celebrated by all the fraternities at KSC and helped change people’s minds about Greek life at KSC, too. Those are just a few anecdotes I can share about Ma Stewart. There have to be many other brothers who Ma helped in so many ways. It’s even possible – though I have no way of knowing – that Ma helped financially to keep TKE house open and running. I remember how we couldn’t pay the electrical or heating bills but somehow they never shut the house down. It would be great to learn more about how Ma helped TKE and even personal information, her birthdate and birthplace, how she came to KSC and how she became our house mother. If you can share any information or stories about Ma Stewart, please send them to admin@lstke.com so that we can add to this tribute.